Elie Wiesel is to receive an honorary doctorate from a university in Krakow. WARSAW, Poland — Nobel laureate and Holocaust memoirist Elie Wiesel will receive an honorary doctorate from the Pontifical University of John Paul II in Krakow. A French motorist who shouted “This is in the name of the children of Palestine” as he slammed his car into a crowd in France is not a terrorist, a French prosecutor said. A group of adults and children in Tel Aviv set a new world record for dreidel spinning. JERUSALEM – A group of adults and children in Tel Aviv set a new world record for dreidel spinning. Some 754 dreidels spun simultaneously for 10 seconds in a row on Sunday at the Sarona Market complex in Tel Aviv. Among those taking part in the record-breaking attempt, monitored by officials from Guinness World Records, was Israeli Justice Minister Tzipi Livni. At least 800 dreidels made the attempt, but not all succeeded in spinning the full 10 seconds. The previous record of 734 dreidels spinning simultaneously was set by United Synagogue Youth in Philadelphia on Dec. 28, 2011. Frazier Glenn Cross Jr., the white supremacist accused of fatal shootings at two Jewish sites in suburban Kansas City, Kansas, was found competent to stand trial. WASHINGTON — U.S. President Barack Obama signed into law a bill that ends Social Security payments to former Nazis. SYDNEY, Australia — Chabad set up a menorah in downtown Sydney as a tribute to the victims of a terrorist attack. Alan Gross was imprisoned while trying to connect Cuba’s isolated Jewish community to the wider world. The deal that got him released five years later may do just that and much more. Gross’ flight home to suburban Washington on Wednesday with his wife, Judy, was part of a historic deal that overturns over five decades of U.S. policy isolating the Communist island nation helmed by the Castro brothers. “We will end an outdated approach that for decades has failed to advance our interests and instead we will begin to normalize relations between our two countries,” President Barack Obama said in announcing Gross’ release and radical changes in U.S. Cuba policy. U.S. officials in a conference call outlined sweeping changes, including the resumption of full diplomatic relations, the opening of an embassy in Havana, and a loosening of trade and travel restrictions. Dina Siegel Vann, the director of the American Jewish Committee’s Belfer Institute for Latino and Latin American Affairs, said Gross’ release and the opening of ties with Cuba is a twofer for the Jews: In addition to the benefits accrued to all Cubans from open relations, she said, Cuban Jews “will have stronger ties to Jewish organizations, they will be much more in the open.” An estimated 1,000 to 1,500 Jews live in Cuba. Back in the United States on Wednesday, Gross held a news conference, which he began with the greeting “Chag sameach,” noting that his release coincided with the first day of Chanukah. He thanked political leaders, the Washington Jewish community, the local Jewish Community Relations Council and other faith groups that pressed for his release. “But ultimately – ultimately – the decision to arrange for and secure my release was made in the Oval Office,”said Gross, reserving special praise for President Obama and his National Security Council. Vann said improved U.S.-Cuba relations would have a rollover effect, removing obstacles to U.S. ties with other Latin American countries — and this in turn would remove tensions that have affected Jewish communities. In a deal American officials said was technically separate from the Gross release, the United States and Cuba agreed to exchange the three remaining incarcerated members of the “Cuban Five,” a Florida-based spy ring, for an American spy held in Cuba for 20 years and whose identity remains a secret. Obama insisted that Gross was not part of the spy exchange and that, in fact, his imprisonment held up changes to the U.S. Cuba relationship he had intended on initiating years ago. Republicans who have opposed easing the Cuba embargo blasted the deal. Many Jewish groups welcomed the deal, however, and noted the political difficulties it must have created for the Obama administration. Gross is in ill health. He has lost more than 100 pounds since his incarceration and suffered from painful arthritis. A senior administration official who spoke to reporters before Obama’s announcement said the Vatican played a key role in negotiating the deal, in part through Pope Francis’ pleas to Cuba to release Gross as a humanitarian gesture. The administration official also noted the significance of the Jewish holiday season of freedom. “We believe that Alan was wrongfully imprisoned and overjoyed that Alan will be reunited with his family in this holiday season of Chanukah,” the official said. 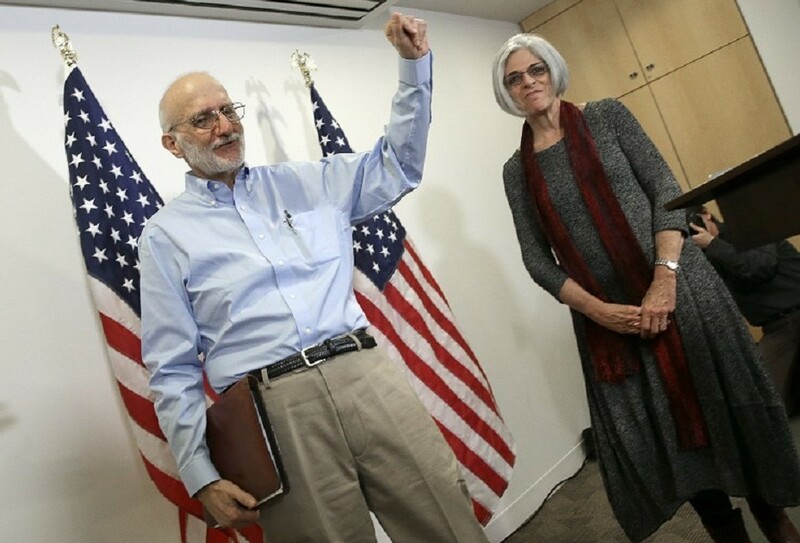 ABC News is reporting the U.S. has secured the release of Alan Gross, a Jewish-American contractor, as part of a prisoner swap with Cuba. Gross, who was arrested in 2009 after setting up Internet access for the Cuban Jewish community while working as a contractor for the U.S. Agency for International Development, recently marked the completion of his fifth year in prison. Cuba charged him with espionage. Gross 65, of Potomac, Maryland, reportedly is in ill health and has lost more than 100 pounds since his incarceration and has suffered from painful arthritis. The European Parliament passed a resolution that supports in principle recognition of a Palestinian state as part of peace talks with Israel. An Islamist gunman holding at least a dozen hostages at a Sydney cafe reportedly was among two people killed in a rescue operation by police.